Just because our family is going through a financial transition, that does not let us off the hook for when it comes to working in the yard this spring. We will be having our first graduation open house next summer, so everything we can do this year to keep our yard looking good is a bonus. Here are some things we are doing that are not expensive or give us a big bang for our buck. We are raking the yard (by hand) to bring up the dead grass and dropping some seeds in the patchy spots to encourage a nice, thick lawn. Did you know that the best defense to weeds is to keep your lawn healthy? That will limit the spaces where the weeds can take hold and hopefully save us time and expense down the road. We are getting out our trusty edger and making the edges look nice. We are planning to water – but only when necessary. Particularly if you have a sprinkler system, it is very easy to just set it and let it run – regardless of the weather. Your lawn needs about an inch of rain per week. When we have some cooler weather or we are getting rain, we try to turn our system off and just let Mother Nature do her thing. Usually, we only water a few times until the heat and dry of July kick in. We have wooded areas and some land, so walking around and picking up any trash that may have blown in is also a quick, free fix to making things look better. I am so happy to have this one crossed off already – we have cleaned up the dog poo from the winter. 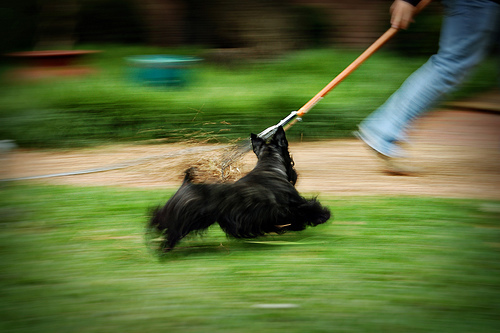 Dog “bombs” are the worst – keeping those cleaned up is a must. We find keeping the these areas of debris is always a huge improvement. A quick sweep when needed and you are done. I have a secret indulgence – pressure washing! I so enjoy it and the results are so satisfying. Check Pow-Pow-Power Wash at Young House Love to see how addicting it can be. Since we own a power washer, it just costs us a little gas to run it, but you can rent one pretty inexpensively as well. Some areas may be stained, and if the power washer doesn’t do them in, cleaning those with a cleaner will help improve the view. As mentioned above, edging the grass next to these areas makes it look neat and tidy. On the patio, cleaning up any toys and tools left nearby is essential to having a nice, clean outdoor space. I have to admit that I am sort of dreading this one, but we will be cleaning the grill. I will also be sanding and staining our outdoor wooden furniture. It takes some work, but does not cost a lot and can revitalize your outdoor spaces. We always give the kids places to store their toys and we try to do a nightly clean up to put everything back in its place. Everything just looks better when we do. Plus, the kids know where to find their things and if a storm hits overnight, things are safely put away. Power washing can help clean up these areas, too. Taking some time to hang out in the sandbox with the kids and pull any weeds that have been growing is also a free improvement. Get the kids involved – see how can pull the most weeds in 10 minutes. In our house, first pick of the Popsicles is a fun reward. We will be getting our annual load of wood chips to spruce up our landscaped areas. This does not cost much and takes just a few hours, but it keeps things looking so fresh and neat. We take a few minutes once or twice a week to walk around and pull any weeds. When we are consistent, it does not take much time and never gets out of hand. I am off the hook this year, but if your perennials are becoming overgrown, spring is the ideal time to divide them. On the plus side – you will have twice as many plants and can use those to help fill in other areas or trade with others for new plants. Feeding and watering the plants and trees. We try to feed the plants and trees a recommended plant food and remember to water them during the driest, hottest weeks of summer. All of these tasks can be done on a very limited budget (most are free!) and make our outdoor spaces a place to gather and enjoy. What inexpensive outdoor projects do you have planned?